One of Ireland’s leading temperature controlled logistics and distribution companies, Dixon International Logistics has been honoured at the 12th annual Fleet Transport Awards 2019 Gala Banquet at the Citywest Hotel, Dublin on Thursday, 11th October. The event was hosted by RTE Radio 1 presenter Shay Byrne in front of an audience of over 950 people, with a resplendent background setting of three DAF Trucks. Two top accolades were bestowed on the Swords, County Dublin headquartered company – Irish Haulier of the Year 2019 and Excellence in Warehousing & Product Handling, both well received by representatives from Dixon International Transport and event attendees. “The independent adjudication panel were impressed with the ongoing progress in every aspect of Dixon International Logistics’ business, which celebrates its 20th anniversary this year. Continuous investment in the vehicle fleet as well as expanding warehouse facilities ensure its transport and storage services are future proofed,” stated Jarlath Sweeney, Group Editor, Fleet Transport magazine. Dixon International Logistics last won the Irish Haulier of the Year Award in 2014, and was successful in winning the International Haulier title three times in 2012, 2013 and 2014. 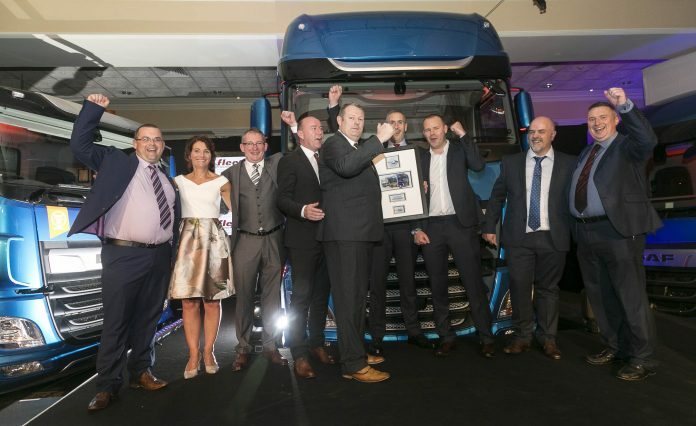 Long established Carna Transport (Monaghan) emerged victorious in the International Haulier of the Year Award 2019, while Toner Transport & Logistics, which traces its foundation roots back to the 1930’s won the National Haulier of the Year 2019 title. For the first time the Services to the Transport Industry was awarded posthumously, with Michael Corcoran, the recently deceased author and transport historian, being honoured.